There’s monthly membership subscription is filled to the brim with extra features, special privileges, and—best of all—ThereVoice. That’s right. You can hear what everybody in-world sounds like and they can hear you! It’s simple, fun, and you won’t believe the difference it makes. So what are you waiting for? 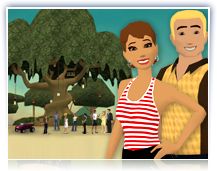 For $10.00, (just $0.33 a day) you can customize your 3D Avatar, text chat, IM, build your buddy list, listen to streamed radio, earn rewards and advance your skill ladder, host and rent clubs, voice chat with friends, bookmark favorite places, shop and list items for sale, join up to 100 clubs, host and attend events and own and rent Neighborhoods. Monthly subscriptions are available through PayPal. We no longer process credit cards directly, but take all payments via PayPal. Your PayPal account must have a validated mailing address and be linked to a reliable backup funding source (generally, a credit card) before you will be able to initiate your monthly subscription. To start your new monthly subscription to There, go to www.there.com to create an avatar. You can download the latest version of the client here. When you go to login, a subscription link will be made available for you to connect your PayPal account. Your monthly subscription will automatically be deducted from your PayPal account each month. You can cancel your subscription at any time. During the second weekend of every month, There offers Free There Weekends (FTW) to new and returning members. Yes, it’s absolutely FREE to play! FTW starts at 6:00 PM Pacific time on Friday and ends at 11:59 PM Pacific time on Sunday. No matter what your budget is, we’ve got you covered. See you There!